Hearts defender Igor Rossi has left the club to join Saudi Arabian side Al-Faisaly Harmah. The deal, which is believed to be lucrative, is subject to a medical and international clearance. 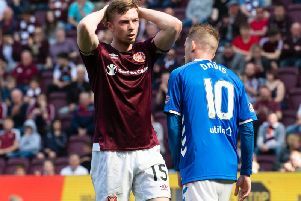 Hearts, who will received an undisclosed fee, confirmed the player’s departure on their website on Friday night. A statement said: “Everyone at the club is sad to see Igor go but he was presented with an amazing opportunity for him and his family and once he had expressed his wish to grasp the opportunity, we obviously would not stand in his way. Rossi, 27, has been a consistent performer in the Hearts defence over the last two seasons, playing at left-back and centre-back. The Brazilian joined the club in summer 2015 after a spell in Portugal with Maritimo.